Crawford Concealed Carry & More LLC is proud to serve Rutherford, McDowell and Burke Counties, and all of Western North Carolina! We are located in beautiful Union Mills — just a short drive from Highway 221 or Highway 64. Please call (828) 748-6000 for directions, or use the map below to help plan your route! Turn onto Camp Creek Rd (right if you are traveling from Morganton; left if you are coming from Rutherfordton). Drive 1.8 miles and look for Fork Creek Baptist Church. Crawford Concealed Carry is 1.5 miles past the church on your right. Turn onto Hudlow Rd (right if you are traveling north from Rutherfordton; left if you are coming south from Marion). Drive 1.6 miles and turn left onto Centennial Rd. Continue for 1.4 miles. Turn left onto Camp Creek Rd, and continue for 3.5 miles. 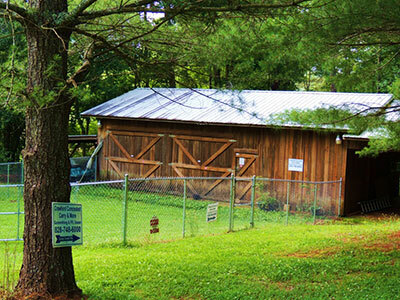 Look for Camp Creek Baptist Church — Crawford Concealed Carry is the second driveway on the left past the church.